Wesley King draws from his childhood growing up with obsessive compulsive disorder in his new middle grade novel OCDaniel. Daniel Leigh knows he's not like other kids — and it's something he's determined to keep a secret. But with help from Sara Malvern — who calls herself a "Star Child" — Daniel learns about where his Zaps come from, and why he spends hours flicking his bedroom light switch on and off every night before going to bed. 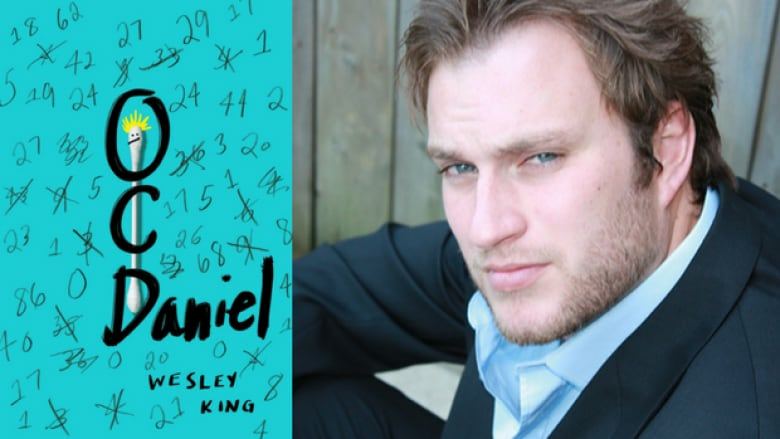 Wesley King's thoughtful, engaging middle-grade novel OCDaniel describes what it's like to manage obsessive compulsive disorder as a 13-year-old who is determined to deal with it alone. King himself started showing symptoms of OCD when he was seven years old and kept it hidden until he was 16. In his own words, King describes sharing his childhood secret with the world. "The character of Daniel and his journey with OCD is representative of my own. As a kid, I considered OCD this deep, dark secret. I didn't think my parents were going to judge me negatively, but I thought they'd cart me off to a psychiatric centre to be honest. My friends and siblings, I thought they would negatively perceive me as damaged goods, someone who was no longer our friend, someone who had this great burden. You never want to be pitied or subjected to that stigma. I think Daniel was saying, 'Everybody wants to be the normal kid. We all strive to do that, good or bad.' I later found out that all the people I'd been hiding it from became the most supportive people of all. You'd be amazed at the support and new connections you form when you step out and ask for help. You spend most of your life hiding a secret and to go from that to releasing a book worldwide that outlines that secret in painful detail is interesting." "As anyone who has anxiety disorders or depression can relate to, you don't lose those things. They can certainly be mitigated with therapy, medication and things like that, but you always live with your OCD. To go back and explore that can certainly cause flare ups. I know a great many people who read books who cause their symptoms to worsen. I always think that informing ourselves and educating ourselves on these topics is difficult at first, but it becomes cathartic over time as we come to terms with how prevalent these things are, and how they are improving in the sense that medicine is getting a better grasp on it." "What my character Daniel goes through at night is an exact representation of what I did. My parents sent me to bed at 9 or 10 p.m., and it was usually 3 or 4 a.m. by the time I was actually in bed. For myself, as for Daniel, it was literally a sense of survival — we were flicking light switches and washing hands because OCD gives you these obsessions. The obsession is any thought that causes you this incredible sense of dread. In my case, it was simple as, if you weren't going to do this, you weren't going to wake up. I was doing that to keep myself alive in some distorted worldview. It would take hours of my life, for probably 10 years of my life. As you can imagine, it was very exhausting and I see on the faces of people who suffer from anxiety disorders and depression, they're just tired. It's an exhausting process." "Star Child is this pseudo-scientific concept of these children around the world who have this extreme intelligence and empathy and the idea that they have some alien DNA. This is sort of a fun conspiracy theory. As a kid, I spent so much time thinking there had to be some alternate reason why I was doing these things that I came up with overly elaborate theories about what my own origins would be as well. It's not that something's wrong with us — we're just special and unique. "As a teenager, probably from 12 to 15, I was quite convinced that I was going to become a Jedi. I was training to be a Jedi and I had developed this overly elaborate theory that Star Wars had been created so that prospects of Jedis on this planet could become ready for it. I thought that maybe I was a little bit strange because it was some sort of tampering of the force. I do hope that it could still be the case." "The middle-grade genre is pretty barren of anything touching on mental health. People think it's still a touchy subject. I've had a little bit of push back from teachers and librarians saying, maybe this is too early to talk about this with grades 4 and 5 students. I was really stunned when they told me that. I never expected that. I always counter by saying, well this is the age when these things onset. So if it isn't too early to get it, it shouldn't be too early to talk about. "On the other side of the coin, a lot of teachers and librarians have come up to me and said, this was a great read for me because it's help identify some things with students in my class. In fact there's a couple school boards who are disseminating these books among their teachers to get a good idea of what anxiety disorders look like in kids that age. Nothing is more important to a kid that age than a teacher or a role model, reaching out to them." Wesley King's comments have been edited and condensed.